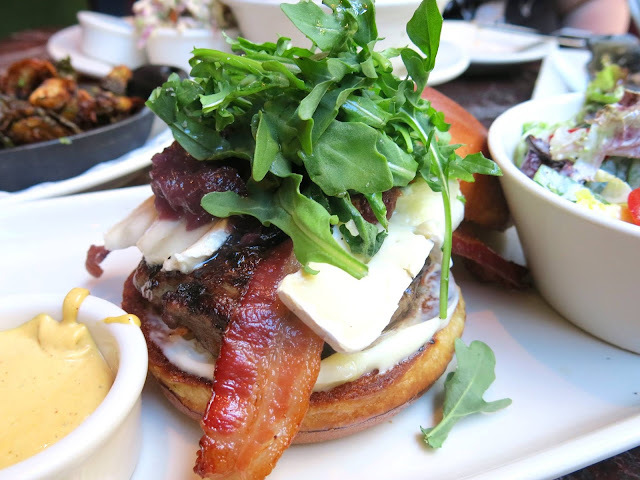 There's no meal quite as magical as brunch. In between breakfast and lunch, it's the perfect way to enjoy a second breakfast without feeling any guilt whatsoever! Chicago is an especially great city to look for this trendy meal. It seems like there's constantly new eateries popping up around town who offer this meal, and it's not just reserved for Sundays anymore! 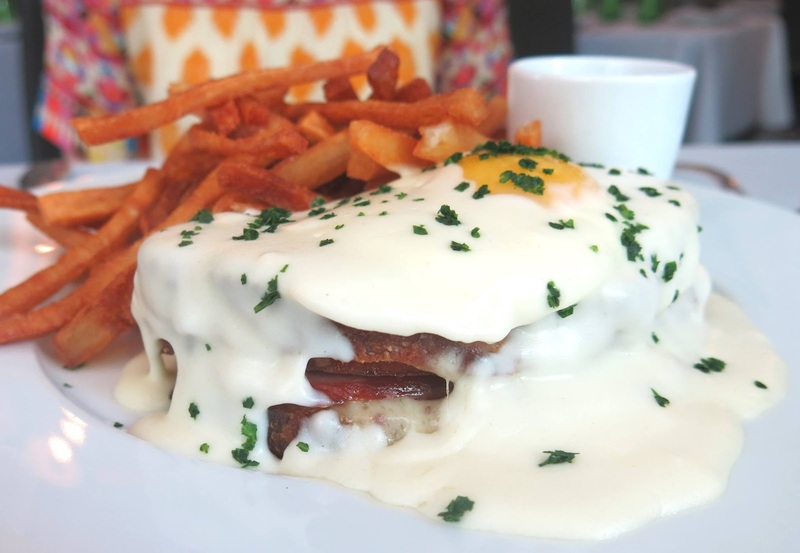 The next time you're solo or with a group of friends looking to enjoy the freshest brunches in the Windy City, be sure to check out some of these sought after destinations. 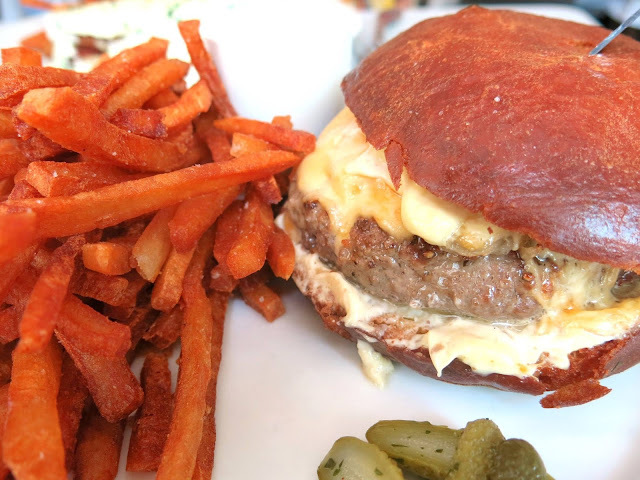 It will be hard to leave this Lincoln Park Cafe without a full stomach! 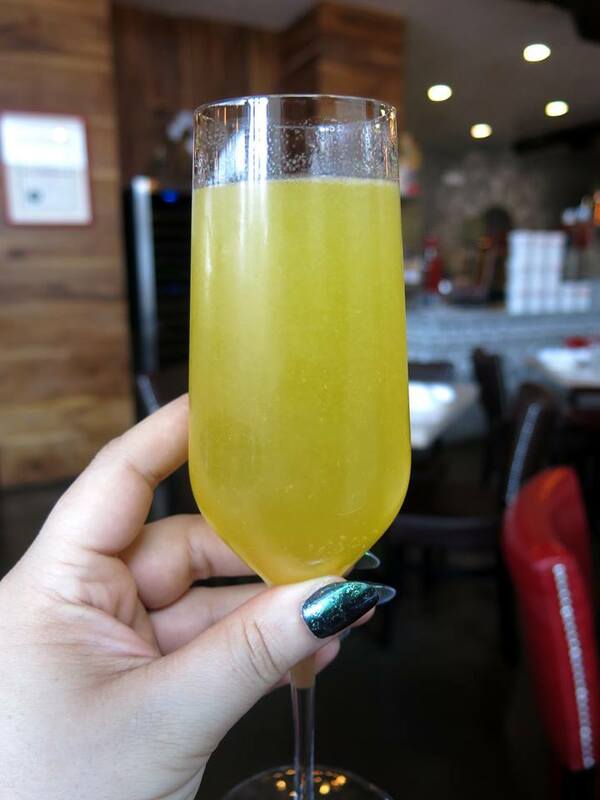 With French toast flights and BYOB mimosas, it's an impressive choice for any day. There are some flavorful savory options to enjoy such as the Black Salmon or Chicken and Waffles. It's not uncommon to encounter a long line at this local business! This option has been serving up meat free dishes since 1983, and that's quite impressive. Plant based diets are much more popular nowadays, but this spot has been bumping even when they were just beginning their journey. 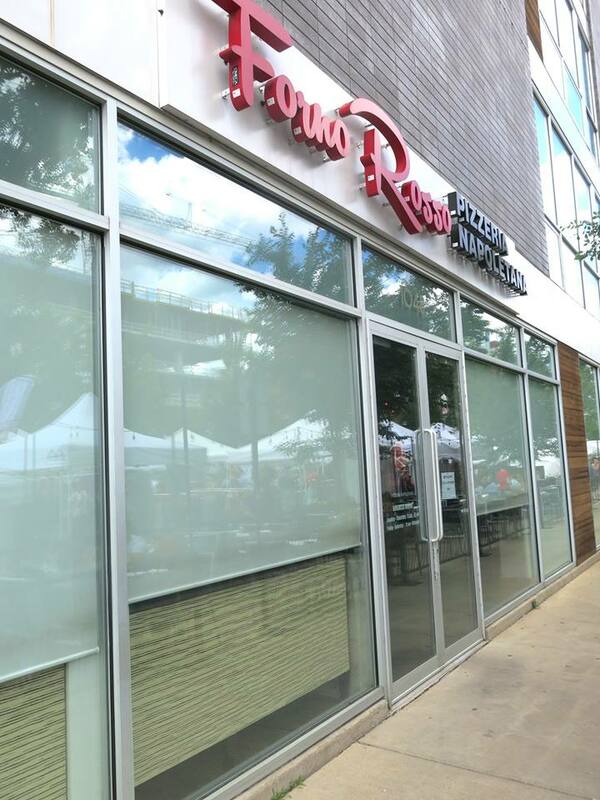 Serving both vegan and vegetarian options, you'll wonder why it took you so long to eat here, especially after trying out their famous breakfast bowls and vegan cinnamon rolls. If you want sophistication on the menu along with creative dishes, this gastro pub in Chicago is always a safe choice for brunch. 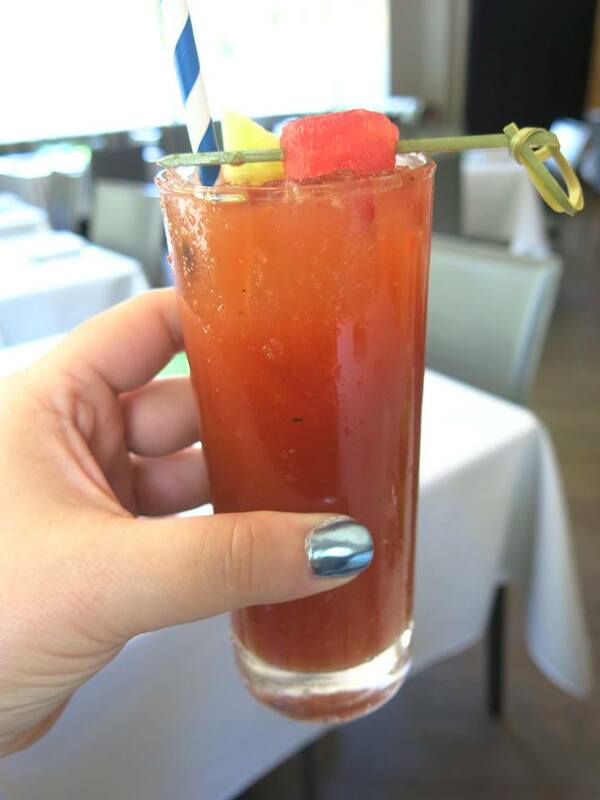 With a locally sourced menu serving brunch from 9am to 3pm daily, you can feel good spending your money here! Their PBR breakfast comes with two eggs, your choice of meat, house potatoes, a can of ice cold PBR and a shot of whiskey. Now there's a great way to start your day! You don't have to limit yourself to one brunch destination. 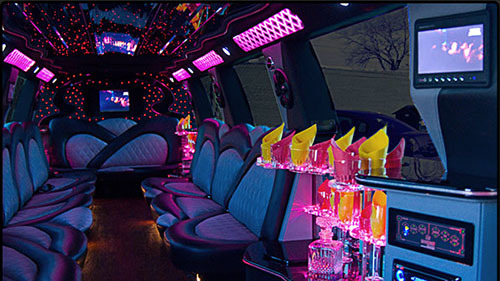 Make a day out of adventuring through the city and enjoying must-visit food destinations along the way with the addition of a party bus or Chicago Limo Service. This is a smart idea for many reasons! Not only will someone else be taking care of the designated driving, you aren't going to have to give directions, parking, or traffic a second thought. 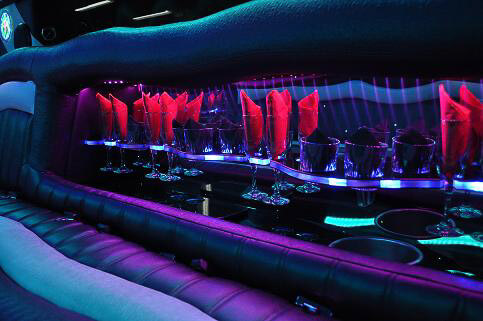 You don't have to limit yourself to with one restaurant or lounge when you have transportation reserved for the day! "Two words: Hen Night," Brandy said to her good friend Starr. "What does that mean? Are you asking me to go out for fried chicken?" "No, silly, a Hen Night! You know, with cocktails and gossiping and lots of fresh summery nibbles?" "Oh! A Girl's Night Out!" "Right! We call them Hen Nights on my side of the pond." "Gotcha. Where should we go?" "Somewhere downtown with a lovely view so we can people watch. 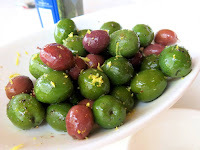 And somewhere with an extensive and varied menu so we have lots of options for snacking. And fantastical drinks, of course. Comfy seating." "Sounds like somewhere we both know very well. Grand Lux Cafe it is!" 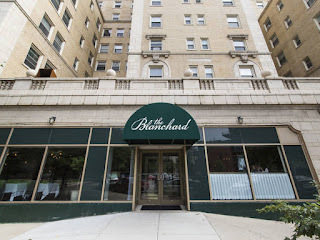 And so, Brandy and Starr headed down to the Magnificent Mile, grabbed a prime booth by the window overlooking Michigan Ave, and started off a night of frivolity and a whole lot of inappropriate giggling. Drinks were in order, of course, to kick everything off. 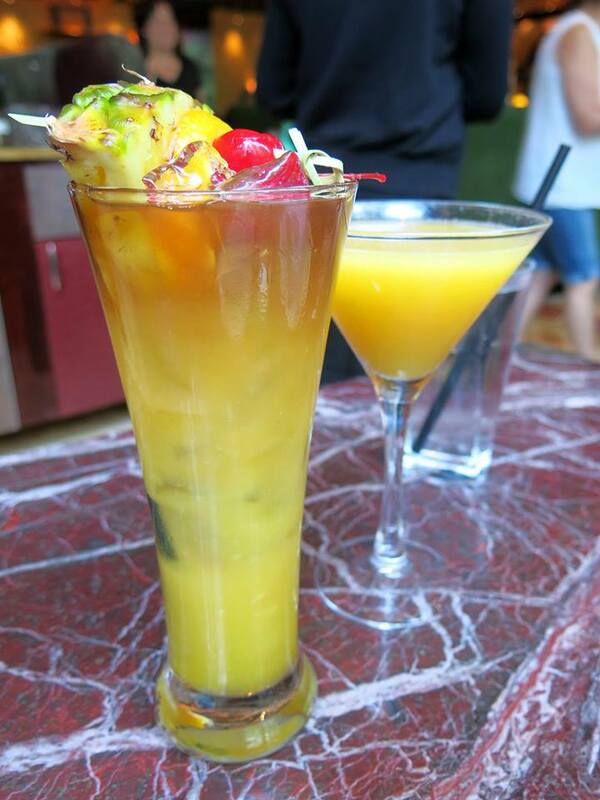 Brandy went with the classic Mai Tai, which she found to be perfectly fruity and delicious. 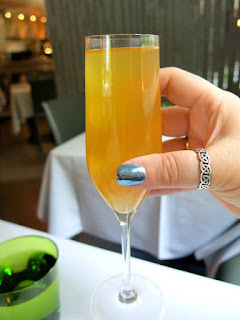 Starr went for the more sophisticated sounding Asian Pear Martini, which she actually found quite sweet and strong, but with a pleasant flavor at the front. Picking from the new summer items, Brandy and Starr ordered the Tuna Poke Tacos, a delightful fusion of Latin and Asian cuisine. 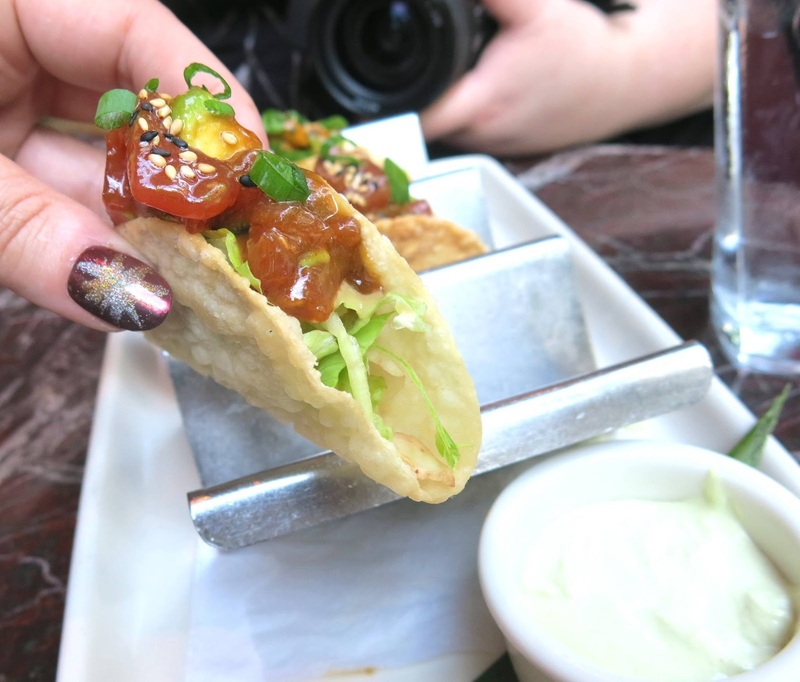 The taco shells were actually deep fried wonton wrappers, which had a brilliant crunch that matched well with the soft and silky filling of tuna, avocado, soy sauce, and sesame seeds. "Now these are the definition of finger-licking good!" said Starr as she finished off the last of her taco. 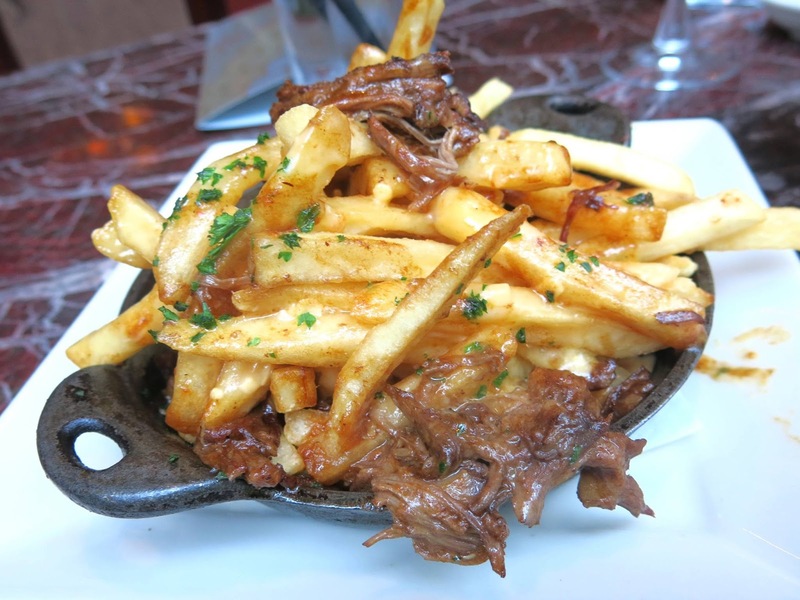 They also ordered the Pot Roast Fries, which Brandy instantly fell in love with. "Tender meat, cheese sauce, and crispy potatoes. This speaks to the most primal part of my soul," she said as she stuffed another handful of fries into her mouth. 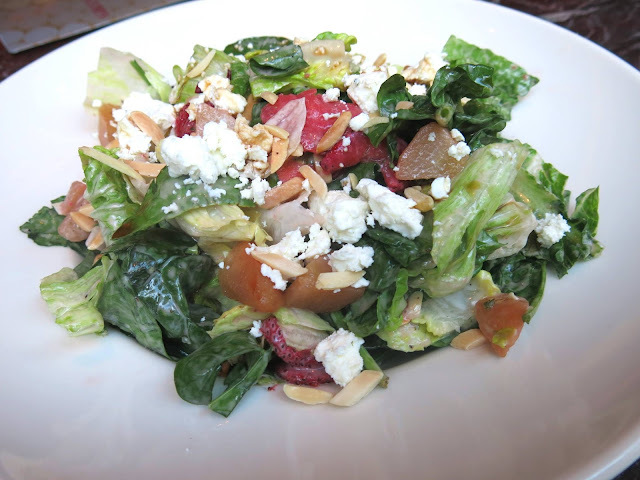 Next, to lighten things up, they split one of the new summer salads, which came dressed with roasted pears, strawberries, feta cheese, and almonds, in a balsamic dressing. Brandy has always been a big fan of fruit in her salad, so this mix of sweet, creamy, and crunchy ingredients was just perfect for her. 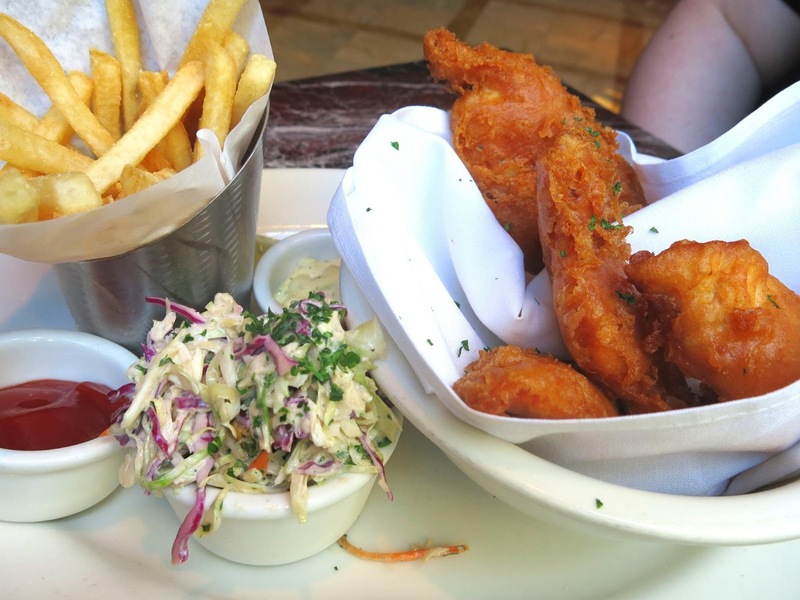 Starr went for the Fish and Chips as her entree, which also came with a side of peanut coleslaw. The fish was tender and light with a nicely crisp tempura batter. She also liked that the dish came with a side of house made tartar sauce, which combine well with the lashings of vinegar she added to the fish. The slaw was also a nice little surprise, as it had a unique peppery flavor and plenty of crunch. also ordered the Crispy Glazed Brussels Sprouts, which turned out to be the best thing she tried all night. Sweet, a little crisp, savory, and so very delicious, Brandy could have eaten several more servings of these sprouts if she hadn't already indulged in so much deliciousness. Finally, the ladies wound down their evening out with a pair of coffee cocktails and an order of Warm Butter Cake. 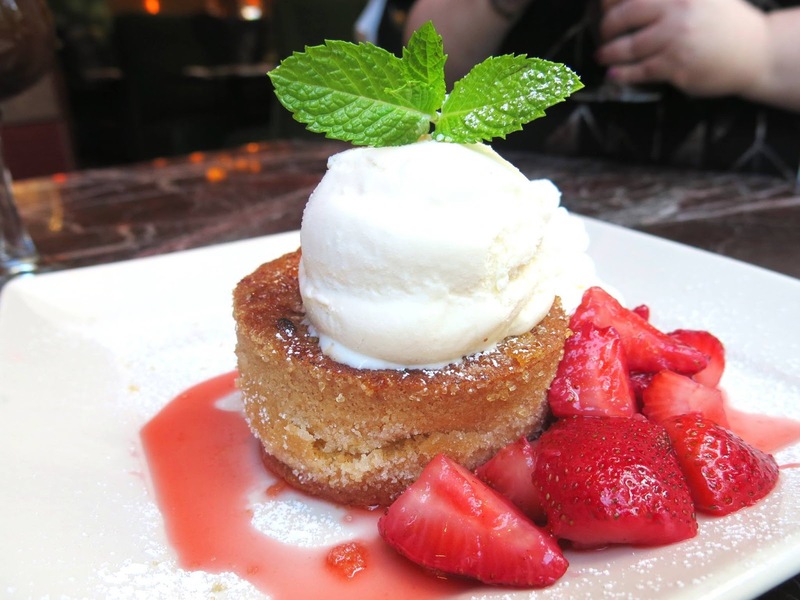 The rich and gooey cake was so perfect with a scoop of vanilla ice cream and a sprinkling of marinated strawberries as accompaniment. Even though both ladies were full to the brim, they still managed to finish off every last bite of that cake, which is certainly saying something. "Ah, we need to do this more often!" Brandy sighed with contentment. "Not too often though," said Starr, "Otherwise you're going to have to buy me a gym membership!" 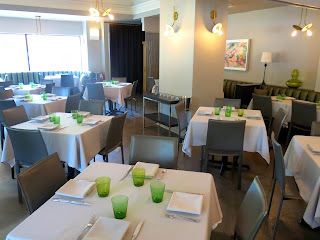 The writers of this blog were invited to dine by the restaurant free of charge in order to facilitate the writing of this post. Food News: Meet Chef Dana Herbert at Macy's on State Street! Note: The writers of this blog have been compensated by Everywhere Agency for the information contained in this post, but the opinions stated were not influenced. Bunny has once again returned to the surface for a breath of fresh air, and this time she is coming back into Chicago with a mission. "My sweet tooth is itching," she texted Brandy, "and that means something exciting must be about to take place. You know I don't usually just start craving sugar out of the blue." In fact, Brandy didn't think this out of the ordinary at all. She was rather used to Bunny's near psychic ability in sensing when there is good food to be had. Knowing better than to take her friend's instincts lightly, Brandy began researching, and quickly realized that there was indeed something exciting on the horizon. 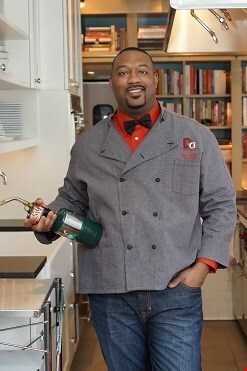 "Your sweet tooth never fails," she text Bunny, "Seems Chef Dana Herbert is hosting a big-to-do at Macy's. Can you get to Chicago by next week?" "I'm already at the airport," was Bunny's quick reply. Bunny had been a fan of Chef Herbert ever since his big win on Cake Boss: Next Great Baker, where he first demonstrated his knowledge, artistry, and passion for pastry to the public. But it's not just the sweets Chef Herbert is good at; he is also trained in culinary arts, meaning he can pretty much handle anything thrown in his direction. His cookbook, Sweet and Savory Union, therefore could not be a more perfect for Bunny and Brandy, who live their lives by the principles of finding the perfect balance between savory and sweet. It's not an uncommon site to see Brandy sitting at the counter of her local tea shop, sipping on the latest exotic blend in order to determine whether or not she needs to buy a bag's worth to add to her tea chest. It was one of these typical late mornings that a mysterious stranger wandered into the tea shop and took the seat beside Brandy. They smiled politely at each other. They eyed each other's cups of tea. Then, just as Brandy was about to finish off her last sip, the stranger reached out with a bejeweled hand and snagged the cup. "Interesting," the stranger intoned in a soft voice, "I see that you are about to take a trip across the city." "Are you reading my tea leaves?" Brandy asked. The mysterious woman smiled, slyly. "Of course," she said. "What rubbish," Brandy scoffed, "I don't believe in any of that heebee jeebee nonsense." "I also see here that you are a great lover of food," said the woman. Brandy rolled her eyes. 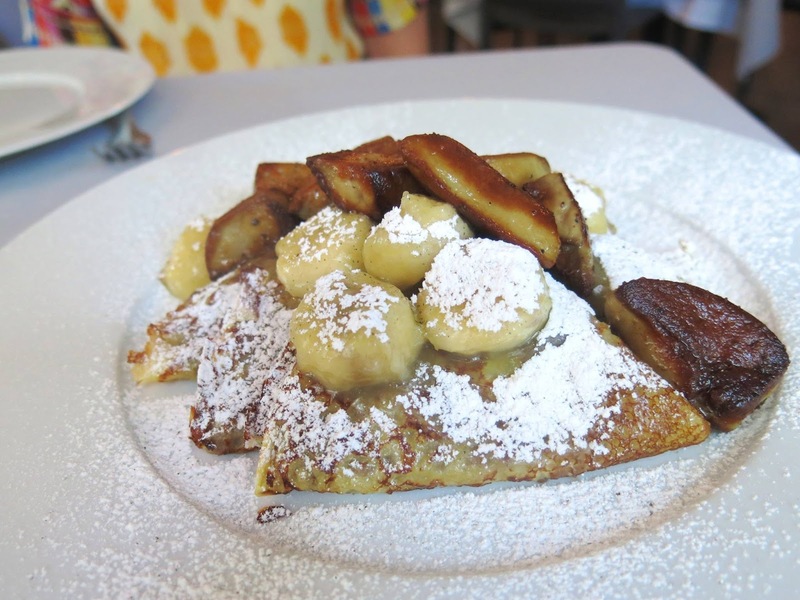 "And that you are about to eat one of the best pancakes you've ever had." This caught Brandy's attention. "Really? Where?" 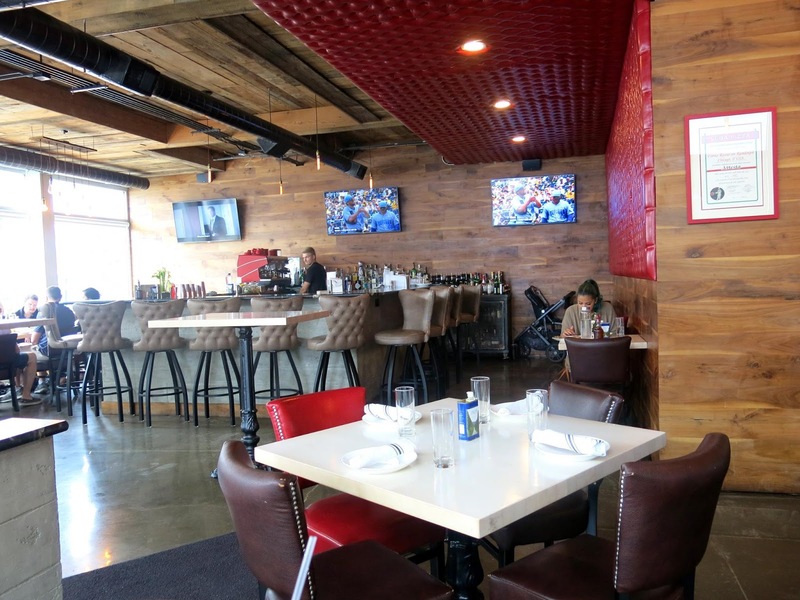 "I'm not sure," said the woman, squinting, "I see pizza paddles and a bar and... that's odd. A pizzeria? Why would a pizzeria be serving pancakes?" "Ah... I think I know where that is. Would you care to join me?" "It would be my pleasure." The stranger, as it turned out, was a woman by the name of Belladonna Blabrun, who made her living in the acquisition and sale of fine healing crystals and all natural tinctures. Brandy was still skeptical about her purported clairvoyant skills, but she was intrigued, as the woman's clues about the restaurant with the pizza paddle led them to Forno Rosso in the West Loop, an up scale pizzeria that had recently started a rather unique brunch service. "I'm not sure about those tea leaves predicting a legendary pancake, but I suppose anything is possible," Brandy said. With all of the pricey, upscale restaurants in the area, Forno Rosso felt welcoming and unpretentious in comparison. The windows that surrounded the dining area made everything feel open and breezy, while the mix of reds and browns in the interior gave a cosy, rustic impression. Right away, Belladonna and Brandy spied some promising items on the cocktail menu. Belladonna went with the Grand Mimosa, which was a traditional mimosa with the addition of some raspberry peach liqueur. While the mimosa did taste a bit sweeter than a typical mimosa, it just wasn't quite unique enough to catch Brandy's full attention. 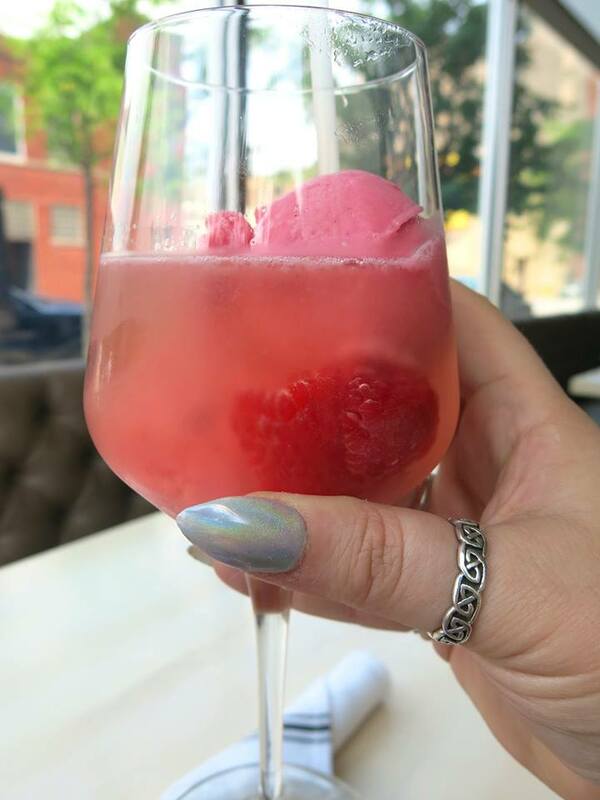 Instead, she went with the F'rosé, a whimsical concoction of rosé and raspberry sorbet. Though not normally the type of brunch cocktail Brandy gravitates towards, she found that she rather liked this outlandish pink drink and thought that it was utterly perfect for summer. Belladonna and Brandy decided to start with a pair of savory shareable plates, accompanied by a bowl of roasted olives for snacking. First up was the Burrata Avocado Toast. 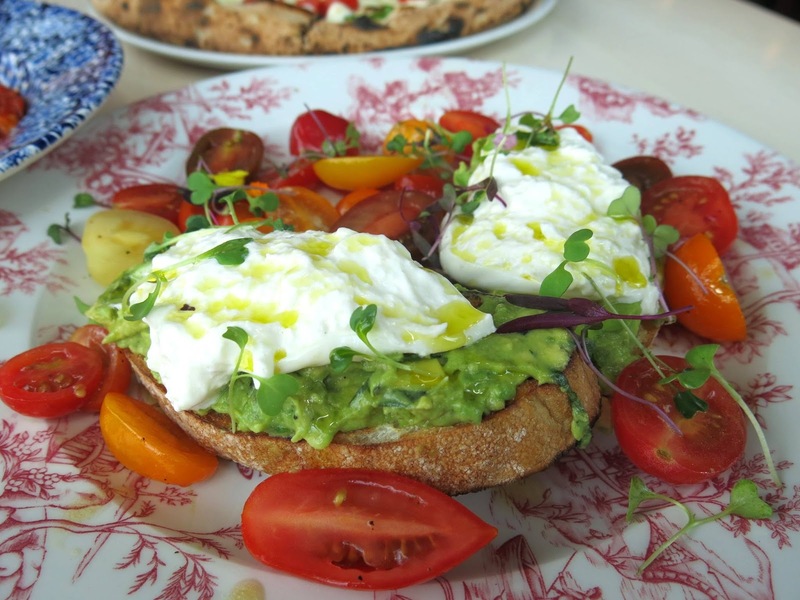 Normally, Brandy is a little put off by avocado toast ("It's a lovely dish, but it's usually under seasoned and over priced," she says) but the addition of burrata straight from Italy seemed to set this one apart. Indeed, the silky, creamy cheese did add some pizzazz to the foundation of avocado and focaccia. Belladonna liked the halved cherry tomatoes as well, which added a much needed brightness to each bite. Next, they shared the Breakfast Pizza, a show piece for the restaurant's wood fired Neapolitan style crust. The pizza came topped with fresh mozzarella, scrambled eggs, more cherry tomatoes, and grilled asparagus. 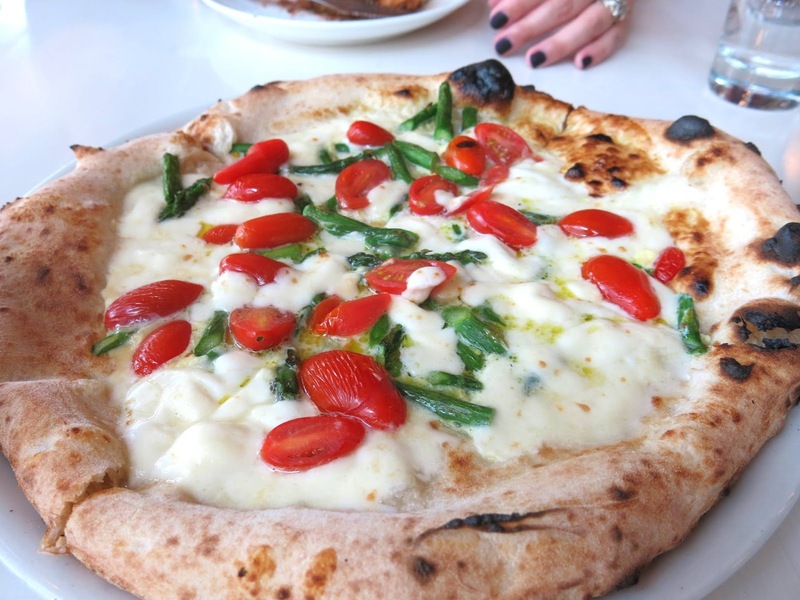 Brandy found the toppings to be in perfect balance, providing just enough vegetation to keep it light and enough cheese to keep it satisfying, while the crust had a brilliant chew and char to it. 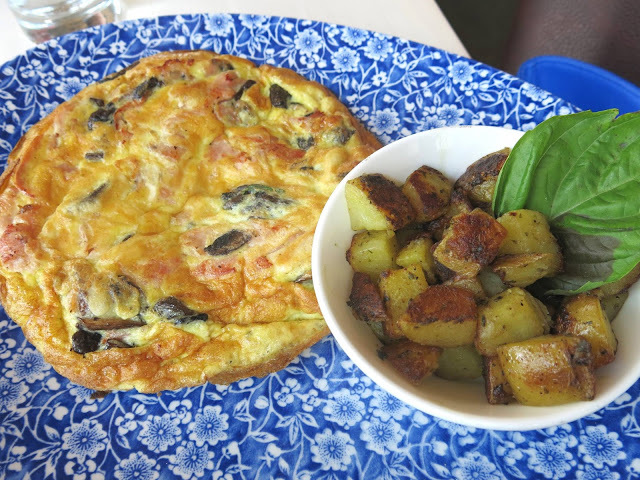 Next, they moved on to a pair of eggy entrees; the Prosciutto Frittata and the Eggs in Purgatory. 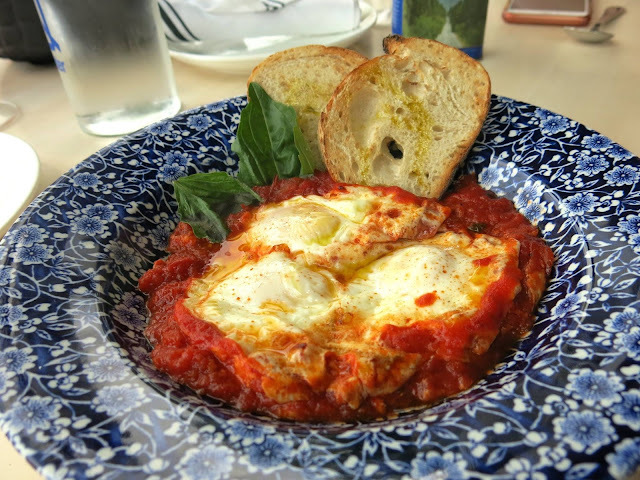 Belladonna very much enjoyed the Eggs in Purgatory, which consisted of three eggs poached in a slightly spicy tomato sauce that was so delicious and deeply flavorful that she couldn't resist scooping up forkfuls of it even after the eggs were gone. Brandy found her frittata to be a little on the salty side and a little dry, but otherwise quite good. It had a fluffy texture to it, which contrasted well with the pieces of mushroom scattered throughout it. Finally, they ended their meal with a pair of sweet dishes: The Nutella French Toast and, of course, the fabled Wood Fired Pancake. The French toast had an excellent texture that was at once soft and chewy, but still held together under the weight of all the toppings. 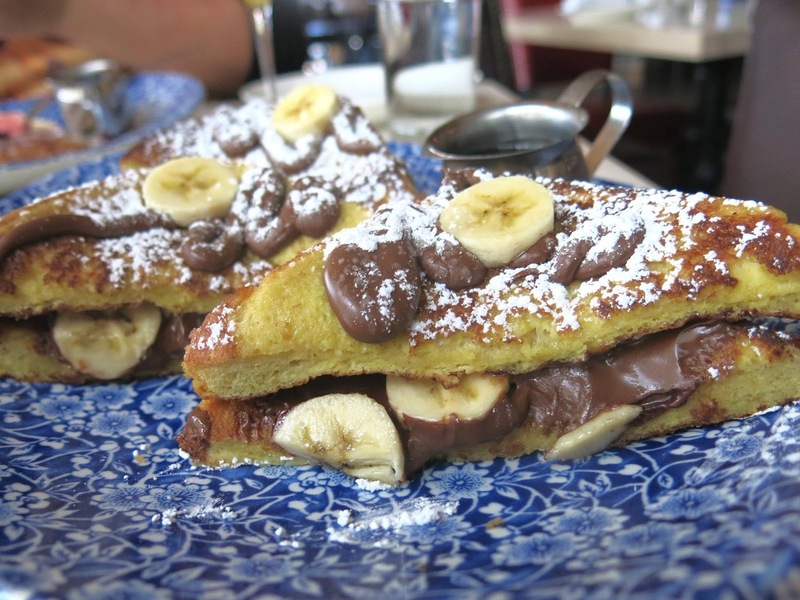 The Nutella made the dish down right decadent, while the bananas helped to elevate it from a sweet dessert to a true breakfast item. The pancake, though, was the star of the morning. 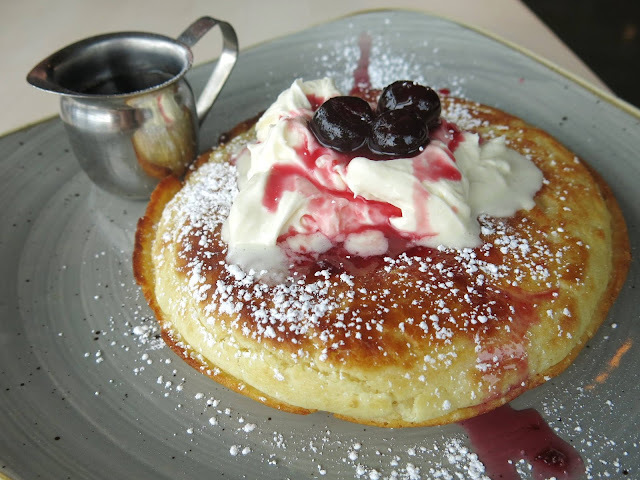 Existing in the nebulous space between flapjack and Dutch Baby, this pancake came served in a skillet, puffed to perfection in the same wood oven the pizzas were cooked in, and topped with whipped cream and marinated cherries. The texture was almost creamy on the interior, making it very unique, and the cherries had just the right amount of tartness and sweetness to really elevate the flavor. "I've never had anything quite like this!" exclaimed Belladonna. 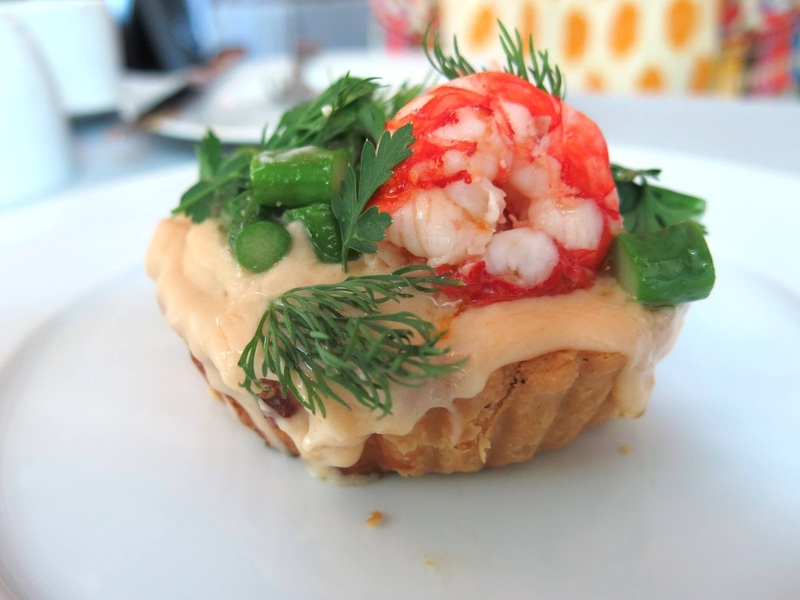 "Surprisingly, neither have I," said Brandy, "Now this little dish truly is magic." 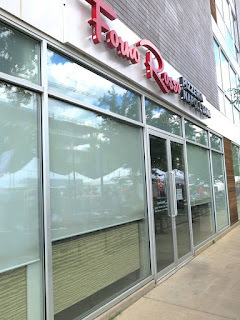 Brandy was very pleased to have discovered a such a casual brunch in the West Loop, but one that was still full or surprises and ingredients of excellent quality. Oddly, the dishware was worth taking special note of, as it's bright colors and retro patterns really did help to invoke the feeling of being served in the kitchen of a Neapolitan grandma. "Praise Mother Earth, am I glad I decided to read your tea leaves," Belladonna said to Brandy, "I've never experienced a meal quite like that one in all my years." "Stick with me, sweetheart, and you'll see all kinds of indulgent brunches in your future," Brandy winked. 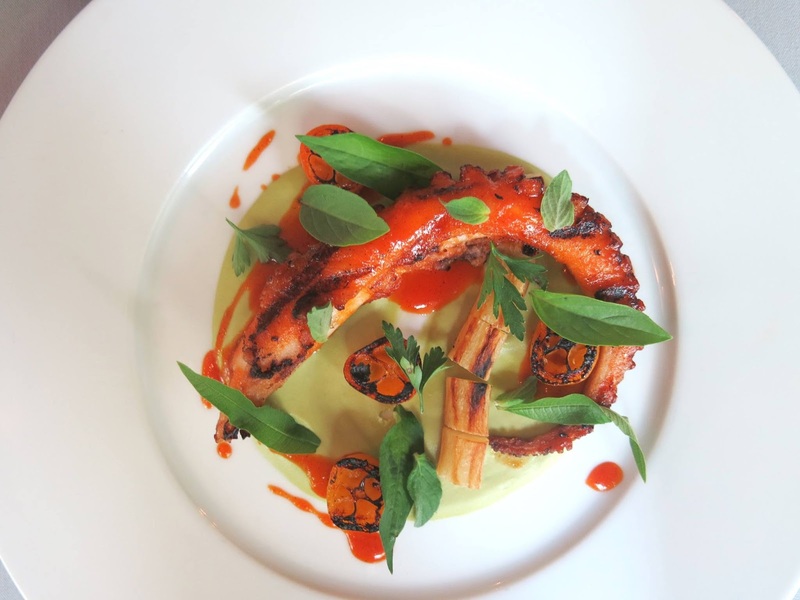 The writers of this blog were invited by the restaurant to dine for free in exchange for an honest review.